We have some new readers at our house, so I was excited to have the chance to review Alpha Phonics with Tiger and Bee! 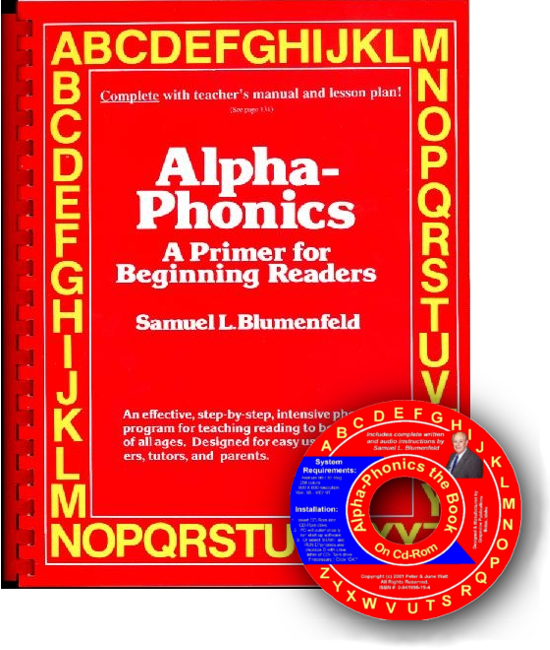 Alpha Phonics was created by Sam Blumenfeld as a method for teaching reading using a phonics approach. The program teaches letter sounds and phonogram sounds, then teaching the child to blend those sounds. Alpha Phonics introduces spelling rules in order to teach decoding. The program has several components. We reviewed the textbook, workbook, and companion readers. Textbook – The textbook contains all the text for each lesson with word lists to practice reading, short stories to build fluency and apply the letter sounds learned, and teacher instruction at the back of the book. The textbook retails for $34.95. Workbook – The workbook has extra practice pages that correspond with the lessons. The workbook retails for $19.95. Companion Readers – The program offers 10 companion readers. The readers are scheduled after certain lessons throughout the program so that the child has learned all the necessary letter sounds to successfully read the book. The readers retail for $24.95. The program also comes with a CD-Rom of the textbook. The child can look at the text on the computer and the teacher can read the instructions or hear them read aloud. All material can be ordered through the Alpha Phonics Website. I started using the program with Tiger first since he is starting to sound out a few words and knows many letter sounds and phonograms. We went through the first several lessons, completing several lessons in one day as a way to review what he’s learned previously. Once we came to new material we slowed down and did a lesson a day. Tiger is a wiggly little guy and doesn’t have a long attention span, so one challenging lesson a day was enough for him. Some of the lessons toward the middle of the book would take us several days of practice and review. Once Tiger was in a routine of using the program, I started at the beginning with Bee. She knows her letter sounds but not many phonograms and can blend only a few CVC words (consonant/vowel/consonant words). She has not had any formal reading instruction. We spent several days on each lesson so she could review the sounds and build her confidence. The teacher instructions are in the back of the textbook. I had to flip back and forth between the text and the instructions until I got used to the flow of the program. The text has large font and is easy to read. The text is also very uncluttered with no color so it’s not distracting to a new reader. The program is very straight forward to use and moves systematically through teaching phonics and spelling rules. It’s easy to adjust the pace of the program and move as quickly or as slowly as your child needs. I found Alpha Phonics to be very straight forward and easy to use once I got into our routine of using in on a daily basis. I would have enjoyed some additional written instruction for holding my hand as I got started with the program. But I found that after a few weeks, I felt much more comfortable using Alpha Phonics. We enjoyed the simplicity of the program as it eliminated any distractions during the learn to read process. We’re on our way to reading! Disclaimer: I received a free copy of this product in exchange for an honest review. I was not required to write a positive review nor was I compensated in any other way. All opinions are my own. I am disclosing this in accordance with the FTC regulations. Alpha Phonics has graciously allowed me to host a giveaway of the Alpha Phonics Text, Workbook, and Readers. 1 of my readers will be able to enjoy using the Alpha Phonics program! Looks like a great program. I'd love to yet it with my daughter. Kim – Yes, the it will be wonderful to hear my kids read the Bible on their own. Curly is now able to read her Bible by herself and it's so exciting to hear! I love that she can read to her siblings as well! I know this sounds strange but my youngest is a lot younger than his siblings who have a DS to play with in the car. My youngest (4) has been promised when he can read he will get his very own DS (for car/travel use)I will be very happy when I am able to see his face full of excitement when he has accomplished that goal! Alpha Phonics looks great! I'd love to try it with my homeschoolers. Encyclopedia Brown series and The Boxcar Children! I know he'd love them. Of course I cant wait till they can all read the Bible themselves, but also great stories that I read as a child. It gives me such a good feeling when they read a book that I read at their age and I get to hear what they got from it. Its sometimes much different! The Bible! Can't wait to hear him read aloud God's word! Steph – Thanks for letting me know. It should be updated now. I remember Sideway Stories from Wayside School and James and The Giant Peach being books that helped instill a love of reading into me when I was young. While I haven't read them in many, many years, I hope they will be appropriate to share with my children one day. I already share so many books with my 4-year-old, but there's something magical going on when they start following along on the page. Can't wait until she can read along in Beatrix Potter.